Obviously only going in a mono-agency deck. But this girl is a beast and worth trying it alone because of her. (not to mention all the other sweet toys). Danigral - 4 out of 5. She’s going into my Yog deck with Twilight Gate or my Shub deck with Shocking Transformation...hahaha. Sure you could put her in a mono-Agency deck and she will win you games, but it’s a better card for Yog and Shub. And she’s not without weaknesses either. A Shotgun will send her back to the earth. Seriously, who still uses a spear after guns were invented? mnBroncos - 5 out of 5. This character alone makes mono-Agency bumped up to tier 1. How many people play loyal cards? How many play loyal characters that can match this Hunter’s power. Sure has no protection but her ability alone makes her safe from most effects. Obtuse - 4 out of 5. A monster in a faction that has a good number of loyal cards. You won’t see many that can hang with her at stories outside a Miskatonic Explorers deck or another mono Agency deck. Kamacausey-4 out of 5. 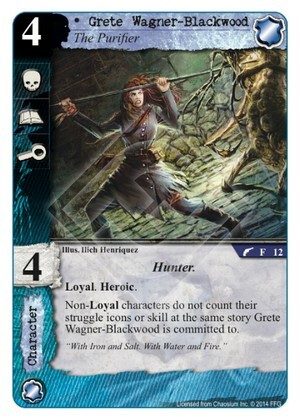 An absolute all star of a character but the fact that she is a four costed loyal means she will only be making it in a mono faction deck more than likely and the only reason she is a 4 instead of a 5.
livingend- 4 out of 5. Rite of the Silver Gate is a force to be reckoned with in the meta and you’re probably gonna make the acquaintance of at least one Khopesh player during any given tournament. But I guess her susceptibility to common removal is justified when compared to her ability to single-handedly win you the game if unanswered. Verdict: It’s either 3x Grete and 3x Iron Cross or bust. WWDrakey & Ire - 5 out of 5. Now, we might not see that much of her, but there's one thing for sure... like O'Bannion's Inner Council, Grete is a "must answer" card when she does hit the table. Exactly like a good 4-coster needs to be. Non loyal characters, I guess that means even your opponent's characters. Yep, any non-Loyals, regardless who owns them. It's mostly there to annoy your opponents, although it can get in your way too. She is pricey, but can be impossible for some decks to block. So if she commits to a story all by her lonesome and my opponent doesn't have any Loyal characters then I would get 3 success tokens at that story. 1 for investigation, 1 for skill, and 1 for the story being unopposed.